We no longer advise our readers to download the Carbon Poker app as they are having banking problems that are delaying withdrawals by 3 months and over. While Carbon resolve these issues, we instead recommend that U.S. based poker players play at Bovada.lv who offer a safe and reliable Texas Hold'em and Omaha mobile poker alternative. You'll find our Bovada iOS/Android poker app review HERE or you can download by clicking on the ad. United States friendly real money mobile poker site. Works on any type of phone or tablet. No install required. Just visit Carbon to start playing instantly on any device. Enjoy Texas Hold'em cash games and Sit and Go tournaments on the go. Carbon Poker will double the value of your first deposit up to $5,000. Carbon Poker is something of a rarity in online poker circles, in that this poker room has no issues with accepting US-based players, as its licence in Antigua & Barbuda allows it to do so. 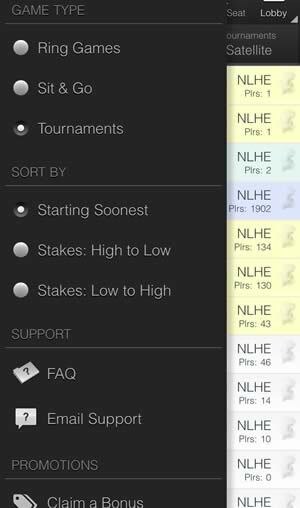 In double-good news for US-based players as well as players from all over the globe, in February 2013 Carbon Poker released a mobile version of their poker-playing software. Here you can find out all about the app, and how you can install it. The first thing you are going to need to do to obtain the app is to open an account at Carbon Poker, which you can do by visiting Carbon Poker and you're ready to play. All that's required is for you to fill in your username, password, email and a little personal information. Below we've added setup instructions for real money iPhone poker, iPad and Android, but since Carbon Poker is browser based it should work on any modern touchscreen phone or tablet, including models from BlackBerry and Windows Phone Nokia Lumia. 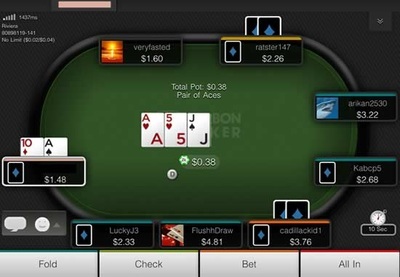 iOS Devices: The Carbon Poker mobile app works on iPhones and iPads that use version 5 of iOS and above. The app itself works inside the Safari browser of your Apple mobile device. 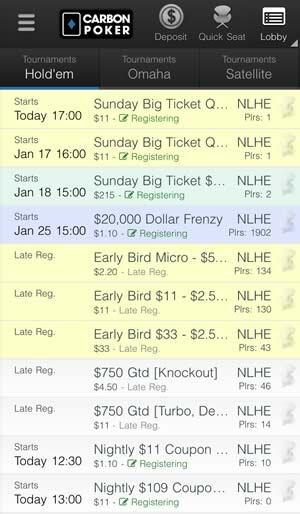 To use the app on your iPhone all you need to do is visit m.carbonpoker.ag. Android Devices: You can use the Carbon Poker mobile app on Android devices that run version 4.4 of the Android operating system and above. The app works best when viewed using Google Chrome. Older versions of the Android operating system may work, but success is not guaranteed. At least version 33.0 of Chrome is required. Once Chrome is installed visit m.carbonpoker.ag to use the Carbon Poker mobile app on your device. Windows Phone Devices: While Carbon Poker has been optimised for iOS and Android poker rooms, since it is a web app it should also work on many Windows Phone models, like the Nokia Lumia 1520 and HTC One M8. If you experience any problems playing from the Internet Explorer browser we recommend you try some of the other free alternative browsers for Windows Phone poker players. Currently, the Carbon bitcoin friendly poker app only supports Texas Hold'em Cash Games and Sit & Go's. Even though you will be playing using the mobile version, you'll still be playing on the same tables as you would if you were playing on your PC or laptop, which means you will never be short of opponents. You can play in Full Ring, 6-Max and Heads Up games, plus when it comes to tournaments you can play in normal Sit & Go's or you can try Knockouts and Double or Nothing at Regular, Turbo and Hyper Turbo speeds. The interface has been expertly designed, and functions excellently on even the smaller mobile screens, although using a tablet is preferable. It's easy to play and when it comes to your turn to take the action, and there are a number of convenient functions that simplify matters, although it's just as easy to do precisely whatever it is that you want to do. 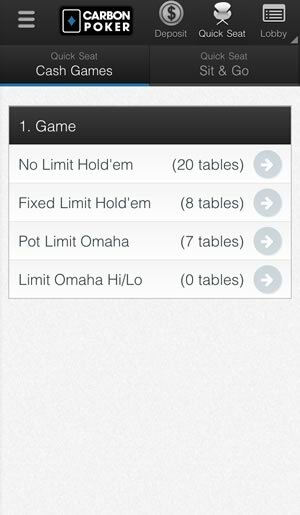 You can browse the available tables via the app and find Sit & Go tournaments to play in. Just find a seat and register, and you're all set! You will not, however, be able to play at multiple tables at once when using the app – currently the app only supports single table play. As an added bonus, you can also use the Carbon Poker mobile app to access casino games and bet on sporting events. This gives you access to over one hundred casino games including multiple versions of blackjack and roulette, as well as allowing you to wager on the top US and worldwide sporting events and horse races. If you are new to Carbon Poker, then when you create your account with the poker room (see above) and use the promotion code CARBONPK when making your first deposit, you will be eligible for a 200 percent first deposit bonus that could be worth an amazing $5,000! To gain the maximum bonus you need to deposit $2,500, but Carbon Poker will double ANY deposit you make as your first deposit as long as it at least $25. Your bonus is released in increments of $10, and you earn $10 for every 1,500 Player Points you earn, and you earn Player Points at the rate of one player point for every $0.10 of rake you generate while playing ring games, and every $0.10 you pay in Sit & Go and Multi-Table Tournament fees. Carbon Poker has a number of other promotions and interesting features, including the chance to win a trip to major sporting events such as the Super Bowl, plus free poker training and a free poker odds calculator. You can fund your account and make withdrawals straight from the mobile app itself. There are a very limited number of deposit options – namely Cash Transfer, Visa and Skrill. Withdrawals can be made via Bank Wire Transfer, Skrill or a personal cheque. All transactions are performed in US dollars. US-based players are going of course to be over the moon with the fact that there exists a mobile app that accepts US-based players without a quibble. As Carbon Poker's licence is based in Antigua & Barbuda the poker room is free from the tight restrictions usually placed on US-based players, although such players may face a little bit of a struggle to fund their accounts. For the rest of the poker-playing universe, Carbon Poker's app really does tick all the necessary boxes if you like to play Texas Hold'em poker – if your preferences sway towards Omaha or less well-known online variants such as Stud and Razz then as yet, you won't find them here. The interface has been really nicely designed, and it only takes a few accurate stabs of a finger to perform whatever action is required, from raising a very specific amount to simply shoving all your chips into the middle of the table. 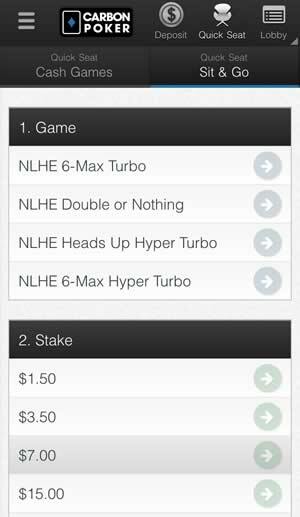 If you love your poker on the go, then Carbon Poker's app is sure to meet with your approval. Why not sign up for your Carbon Poker account and then head on over to the Carbon Poker mobile site? Don't forget to take advantage of that sizeable bonus package that could be worth up to $5,000.